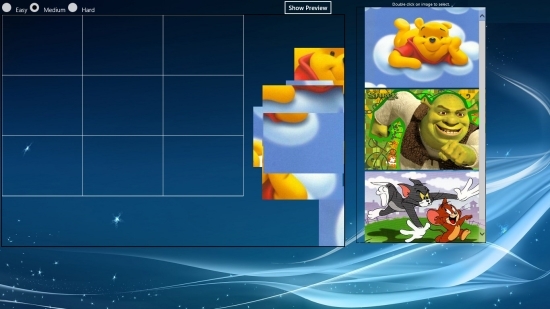 Jigsaw Puzzle Games Kids is a free Windows 8 Jigsaw Puzzle game app in which you have to arrange blocks in the grid as per the picture displayed. 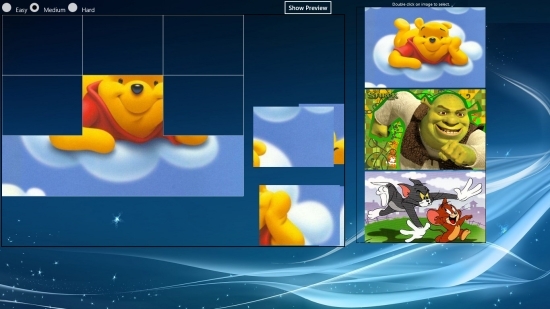 In this free Windows 8 Jigsaw Puzzle game app, you have to drag pieces on to the grid to arrange them so as to make a perfect picture. This free Windows 8 Kids game app is very interesting with varying levels of difficulty. There are three levels of complexity namely Easy, Medium, and Hard with grid divided into 4, 9, and 16 boxes respectively. There are three interesting cartoon images to choose from and play. The game has easy controls as you just have to drag pieces to arrange them in the boxes on grid. Jigsaw Puzzle Games Kids is freely available under Games category of Windows Store. You can view the app directly in Windows Store using the link given below at the end. Let’s have a detailed look at this interesting Jigsaw Puzzle game. This free Windows 8 Jigsaw Puzzle game app has a colourful interface and it contains puzzles of kids’ favourite cartoon characters. So, your kids will definitely find it exciting. As you land on the app’s Start screen, you will be shown an empty grid on the screen. Besides this empty grid, pictures of three popular kids cartoons will be displayed. You can choose among these cartoons to play a jigsaw puzzle. On top of the empty grid, you will find playing options – Easy, Medium, and Hard. Select your difficulty level and cartoon image. Now, drag pieces to place them in appropriate boxes in the grid as per the picture displayed and make your picture perfect. If you still find it hard to put these pieces correctly on the grid, you can click on Show Preview option placed on top of the grid to get an idea about the placement of various pieces. Also check Block Puzzle Free, Magic Puzzles, and Match A Shape. Jigsaw Puzzle Games Kids is an exciting Jigsaw Puzzle game for kids that contain images of kids’ favourite cartoons. The varying levels of difficulty makes it apt for kids of different ages. Get this app now and let your kids explore, play and have fun. Share your feedback via comments. Get Jigsaw Puzzle Games Kids here!